There are many tools and objects that can be used in self-defense. A set table, for example, is a veritable arsenal (keys, cutlery, chairs, etc.) Of course there are more obvious devices like stun guns, pepper spray, mobile alarms, gas pistols etc. None of those things can guarantee for total protection, though, and should not give a false impression of security. S.D.S.-Concept shows the student the possibilities of self defense with a range of different self defense impact tools, including short hand sticks, kubotans, keys, phones, belts, chains, ropes, canes, sticks or batons, all using the same basic form. An impact weapon has far less repercussions than edged weapons in terms of law, ethos and karma. The Kubotan is a self-defense weapon developed by Takayuki Kubota. Kubotan is a registered trademark of Takayuki Kubota, who originally developed it as a tool for police officers to restrain suspects without permanent injury. It gained popularity in the mid-1970s when Kubota first brought the weapon to the attention of the LAPD and began schooling female officers in its application. Other sticks: Self Defense Stick (SDS), Palm-Stick, Dulo. Alternatives are mobile phones, marker pens, pens, spoons, knives, handles and more. Pocket sticks go by various names, like S.D.S., Palm stick, Dulo Dulo, Kubotan, Yawara. Many people carry the pocket stick as a keychain, which makes good sense. 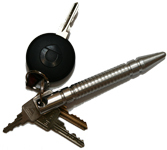 Keychains are seen by most others as just what they are – everyday items. The Pocket Stick or S.D.S. is a powerful, portable, simple device that greatly amplifies your ability to deliver force when necessary. Still it is often ignored and underestimated as a self-defense tool. While the material, shape, length, and design of your pocket stick is a matter of personal preference, the basic concept behind the device is one that has been applied successfully. The Yawara is a Japanese weapon. It is the typical weapon of Yawara-Jitsu. It takes the form of one or two small, thick clubs which stick out about an inch from each side of the hand. Introduced by Professor Frank A. Matsuyama. Matsuyama in the 1940s, the Yawara stick soon became popular with police officers. Matsuyama also created his own lethal version. Yawara is also a system of martial arts, and the name has been used interchangeably with Jujutsu. There are similarities in the kanji for Yawara and Jujutsu. The yawari, tessen (iron fan), and short stick are used to apply Yawara or Jujutsu techniques. The Yawara movements are believed to have been derived from the sheathed knife techniques of Tantojutsu. The Travel Wrench is a modern Self Defense Tool. It is designed to be held in your hands, and protects your hand and fist when you punch and block. It is made of unbreakable solid plastic, and has devastating effects when you strike the attacker, yet it is not a lethal weapon. It is easily carried in the pocket, and looks like a tool, so your attacker will not even recognize it or know what hit him! 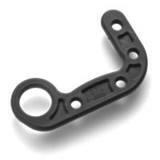 The Travel Wrench is a devastatingly effective yet low profile non-lethal tool for personal protection.